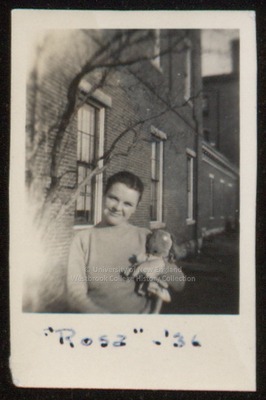 Rose Bonheur, a Westbrook Junior College student, stands on the back side of Hersey Hall in this sepia toned candid snapshot labeled, on the front, "Rosa' -- '36." Rose wears a pull-over sweater and holds a stuffed animal or mascot in her left arm. Her head is cocked to one side and she smiles directly at the camera. Written on the back in ink is "Rose Bonheur." Behind Rose is the back side of Hersey Hall with the Dining Hall (lower building) connecting Hersey Hall and Goddard Hall.